Triathlon Coach Shem Leong tells Joan Chew it is important not to overtrain to avoid getting burnt out – reproduced here for your reading pleasure! 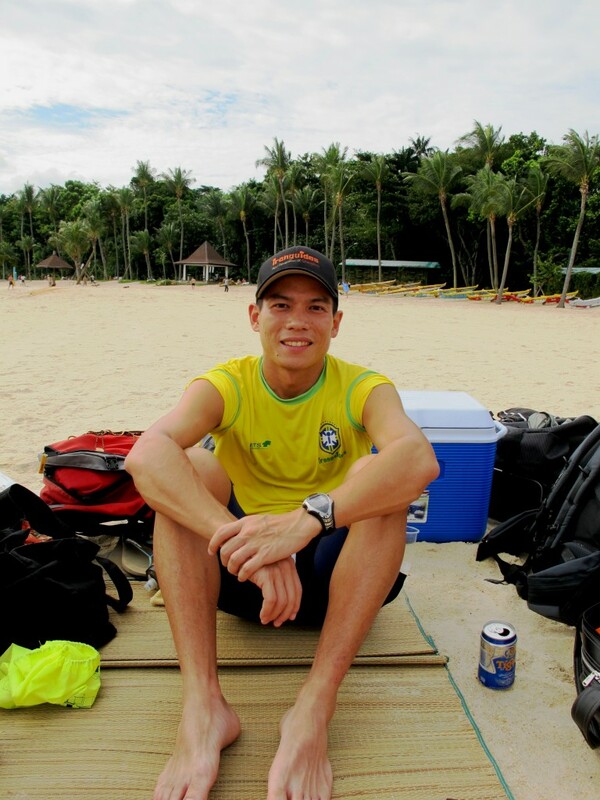 Mr. Leong is the only Singaporean member of the global organisation of triathlon coaches, ironguides. He customises training programmes for his clients to help them realise their sporting goals, usually to complete endurance events. Before becoming an ironguides coach 4 years ago, he worked as a manager, but was already reading up and experimenting with different triathlon training methods. His degree in Health Science from the University of Adelaide sparked his interest in how the body responds and adapts to different training stimulus. A fellow triathlete saw that he had the traits of a good coach and connected him with ironguides, launching his professional coaching career. He takes part in one or two endurance events a year. In August, he topped his Age Group at the Half Ironman Distance Metaman Triathlon in Bintan. His wife, 34, works in banking, They have a 13 month old daughter and another one on the way. Twice a week, I swim, run and do cycling interval sessions on a stationary bike on my own. On Saturday mornings, I ride on the road with a group of friends. I also try to squeeze in core and functional strength work using kettlebells and TRX suspension training equipment. It may sounds like a lot but it only works out to about an hour a day in the weekdays and a little longer on the weekends. How far I cover in session really depends on what phase of training I am in. When building up for a Ironman distance triathlon, which comprises of a 3.8km swim, a 180km bike and a 42.2km run, I step up my training about 2.5months before race day. The distance of my swims will grow from 2 to 4km, bike rides from 90 to 160km and runs from 12km to beyond 25km. I work on all aspects of triathlon fitness – strength, speed, tolerance, skills and, of course, endurance. Tolerance refers to a person’s ability to hold a certain intensity for a period of time, whereas endurance refers to his stamina. How has your exercise regimen changed over the years? I have started to add basic strength work to my weekly training schedule as I get older. Lean muscle mass decreases naturally with age. As a younger athlete, I also used to push myself at every opportunity because it was satisfying and I felt as though I had trained really hard. I thought that training more and at a higher intensity was the way to get fitter. I ended up feeling fatigued al the time, frustrated that I was not seeing any improvement and losing my enjoyment of the sport. It took a good friend and training partner to gently tell me that I might be overdoing it. Now I know the importance of mixing up easy sessions with hard sessions to ensure longevity in the sport, continual improvement and enjoyment. What would happen if you miss an exercise session now? My training revolves around my life, not the other way round. So I’m not too fussed if I miss an odd session here and there. It’s the long term consistency over months and years that pays the dividends. What is your secret to looking so fabulous? I like feeling fit, so I try to exercise consistently – doing a little bit of something every day and varying my training intensities rather than hammering 2 to 3 mammoth sessions per week. I also try to make the healthy food choice 8 out of 10 times. Has there ever been a time when you were not fit and fab? What age were you at? What happened then? I was a plump teen from 12 – 17 years old. After that, I tried to get my weight off the wrong way through the excesses of a hard partying lifestyle. While I became thin, I was very unhealthy. I discovered healthy living only in my late 20’s when I had enough of keeping late nights. While studying at Adelaide University in South Australia, I went for a run in the trails one day, just to blow off some steam, and something clicked. I enjoyed that experience, and running gradually became a part of my life. I have a pretty normal diet. . For breakfast, I like to have a bowl of cereal or 2 pieces of toast and coffee. Lunch is a sandwich or char siew (roast pork) rice. I have a snack in the late afternoon which is usually a big homemade fruit or veggie salad. I conduct group training classes most evenings and have dinner late, so I try to practice portion control. I also make it a habit to have a healthy snack straight – a fig bar, a small tin of nuts or a piece of fruit – straight after a training sessions because that is when the body is most absorbent and responsive to what you put in to it. I only count calories when it comes to fuelling my long training rides and runs because it is important to know how much my body needs per hour in order to keep going. The usual suspects – chocolates, ice cream, and yes, chocolate ice cream. I also have a ridiculous weakness for potato chips. My rule of thumb is not to have desserts on the weekdays and then let go a little on the weekends. Fortunately, a little taste of the good stuff is enough to keep me happy – usually. What do you do to relax /how do you maintain a healthy work-life balance? Chilling out with my wife and 14 month old daughter really helps to put my life in perspective. If I have had a couple of tough days, I will give myself half day to laze in front of the television. I try to write in my journal at least a few times a week as this keeps me centered. What are the three most important things in your life, and why? My faith, family and sport. I try to live by the principals of my faith, which keeps me grounded. My wife, daughter, parents, siblings and loved ones on both sides of my family accept me for who I am and this allows me be at ease all the time. I find that training, contrary to popular belief, energizes me for work and helps me to maintain a nice routine week after week. Would you go for plastic surgery and why? If there was an affordable and pain free procedure to make me half a foot taller – why not? Yes, but only after I shave my legs.